including The Barefoot Review, Poetry Pacific, and Haiku Journal. 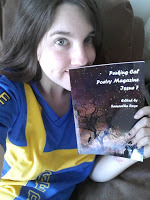 She has also published her first poetry chapbook, Empowerthy, which deals with themes of empathy, empowerment and cancer survivorship. She also enjoys listening to music, travelling, the internet, attempting to learn Swedish, and of course, reading and writing (she also has her own writing blog). To see the kind of work she says yes to, take a look at some previous issues of Peeking Cat Poetry Magazine.